← How do we observe galaxies further than 13.7 billion light years away? You know I love getting mail. I like getting questions, brain-teasers, compliments, or in rare cases, all three. Not every question is right for my “Ask a Physicist” column over at io9, either because it’s a bit too specific or a bit too technical, but even so, sometimes the answer is so much fun that I have to share it with you. 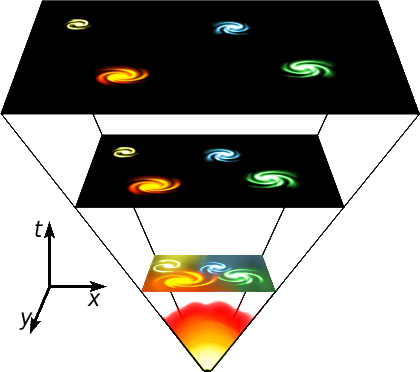 If Dark Energy is in fact “energy”, and it is somehow vacuum energy, then since the universe is expanding, the amount of vacuum is increasing over time and thus the amount of dark energy is increasing over time. Doesn’t this violate the conservation of energy and thus the time translation symmetry? To Stephen: Thanks so much for the kind words. I’m glad you’re enjoying the book, and it seems as though have stumbled upon exactly the right recipe for getting a prompt response: flattery. You’ve also stumbled on an extremely good question, and one that makes the idea of a conservation law a little tricky to describe in an expanding universe. To the rest of you: For those of you not already in the know, Stephen is referring to a consequence of Noether’s Theorem which says, in short, that every continuous symmetry in the laws of physics give rise to a conservation law. The laws are unchanged at all places in the universe, and therefore, according to Noether’s Theorem, we get conservation of momentum. The laws are unchanged over time, and therefore, we get conservation of energy. There are others, but you get the gist. Noether is the patron saint of symmetry, and the hero of my book. Conservation laws are the bread and butter of physics. Conservation of momentum yields the wobbles of stars from the orbits of the hidden planets around them, as well as the principles behind rocket science. Conservation of energy gives us the principles behind gravity and the atomic bomb. Conservation of angular momentum ultimately explains, among much else, why our solar system is spinning in a nice, flat plane. The local definition. Suppose we have a conserved quantity (electric charge, perhaps). The rule is that individually, the only way for the charge within any given box to change is for charges to pass through the boundaries between an adjacent box, either in or out. This is like money. The change balance in your account is directly related to the money put in (by deposits and interest) less the amount you spend (and fees). The global definition. Add up the amount of charge in ALL of the boxes now and at some point in the future. They should be unchanged from the first count to the last. Common sense dictates that the two of these definitions should be the same, but in an expanding universe, they aren’t – or at least the definition is a little more complicated. Indeed, in Einstein’s universe, time gets wonky in lots of ways, which means that it’s not even obvious how to count up all of the stuff in the universe at one particular time. In other words, it’s only the local definition that matters. Imagine we construct a large (many light years on a side) impermeable box in space. Imagine now, that if the universe doubles in size, then the dimensions of the box increase by the same ratio. For ordinary matter, this isn’t a problem. Double the box, the volume increases by 8, thus the density goes down by a factor of 8, exactly as it does in the real universe. Credit: The good folks at wikipedia. But what about photons? Photons carry energy, and the universe is filled with them. Early on (in the first 70,000 years or so), they dominated the energy of the universe. But now think about them in our box. The universe doubles in scale, the density of photons goes down by a factor of 8 (there are a fixed number in total, after all), but also, the energy of each individual photon drops off by a factor of 2 (that’s what’s illustrated up at the top). The energy density drops by 16!, and thus the total energy density in photons has gone down. What happened? The secret is that photons have pressure, and in a relativistic universe, we don’t simply consider energy or momentum separately. Rather, we consider the entirety of the “stress-energy,” which includes pressure and momentum and energy and turbulent flows. This is really the conserved quantity. After all, since space and time are coupled, you didn’t really think that momentum and energy weren’t also coupled, did you? Instead, think of what happens to the box as it expands. The photons and the box act like a piston. They apply pressure on the box as it expands, and thus, they do work (Pressure*change in volume is work). If you do work, you lose that amount of your energy. And numerically, it works out perfectly. which is just a fancy way of saying that you have to include all of the contributions of energy, pressure, etc., and calculate the changes over time, space, and the curvature of the universe itself and that is equal to zero. If that’s too much of a mouthful, you can just as easily say that the photons did work in the expansion and transferred some of their energy into the universe itself – really the gravitational field. It’s very much like energy being used to overcome the gravitational attraction of the earth. Yes, it really is rocket science. Now how about Dark Energy? Dark energy is weird because it has negative pressure, what we’d call tension. If positive pressure (like with photons) does positive work, then negative pressure does negative work. Dark energy PULLS energy out of the universe as it expands. What makes a cosmological constant special is that it’s exactly the right pressure to keep the density the same no matter how much you expand it. The magic number — the ratio of pressure to energy density — is known as “w,” and to be a true cosmological constant, . Most cosmologists, myself included, pretty much assume that w is identically -1, but we still need to measure it to be sure. A perfect cosmological constant has a lot of interesting properties. For instance, unlike a normal gas, where you can feel that you’re moving relative to it by air resistance, a cosmological constant appears exactly the same no matter what your state of motion. Moreover, it behaves exactly the same way that the so-called “vacuum energy” of the universe is expected to behave, except for one not so small difference; it’s a factor of times lower density. BUT… we still need to measure it to be sure. And interestingly, recent results (ones with fairly large systematic errorbars, to be sure), actually suggest that the best fit value is . As I said, between the systematic and random errors, it’s entirely possible that this is just a random fluctuation, but the universe would be more curious still if our dark energy weren’t a cosmological constant. This entry was posted in Uncategorized and tagged cosmology, physics. Bookmark the permalink.